Take one guess where this restaurant is located. It’s not New York. It’s not Los Angeles, nor is it Charleston. This new(ish) and extremely stylish restaurant is located in Chattanooga, Tennessee. It’s called Whitebird, and it’s a seriously stunning interpretation of classic design. The Whitebird restaurant. Designed by The Getty's Group. Image via The Edwin. Located inside the uber chic and long awaited boutique hotel, The Edwin, Whitebird features a classic black and white palette mixed with luxurious details. Designed by The Getty’s Group of Chicago, the design team studied the Chattanooga area extensively prior to the construction and planning of the hotel. With a recent downtown renaissance and piqued public interest, Getty’s Group felt confident the city was “ready for a boutique hotel.” And they went all in, focusing on creating a stylishly southern space. Where to start? 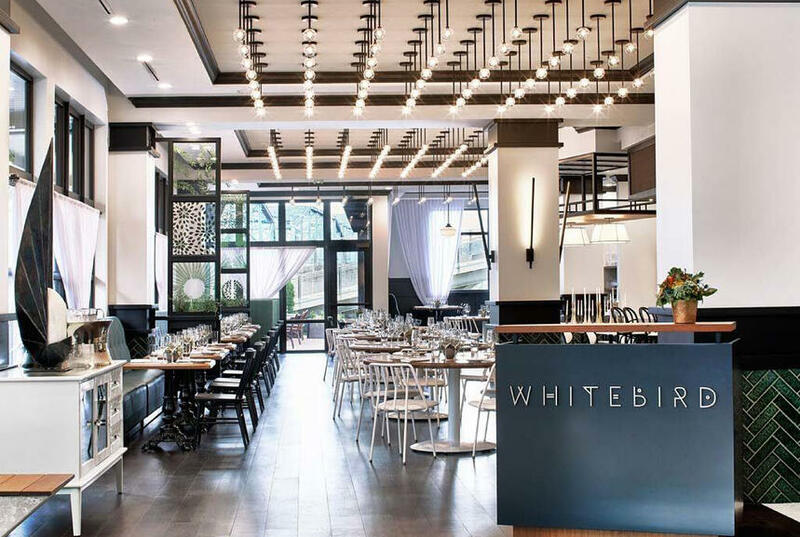 From architecture to stemware, Whitebird is expertly layered with tasteful details. The space boasts tin ceilings, dark wide plank wood floors, charcoal wainscoting, and emerald green herringbone tile. Against alabaster walls, these classic elements feel fresh and light. It’s definitely classic but without feeling austere. For furniture and fixtures, Getty’s Group mixes classic with modern. Traditional solid wood round dining tables contrast the ultra modern white steel chairs. Upholstered Bentwood chairs add a healthy dose of charm while Windsor-style chairs keep things stately and southern. This mix of seating feels fancy but not precious. 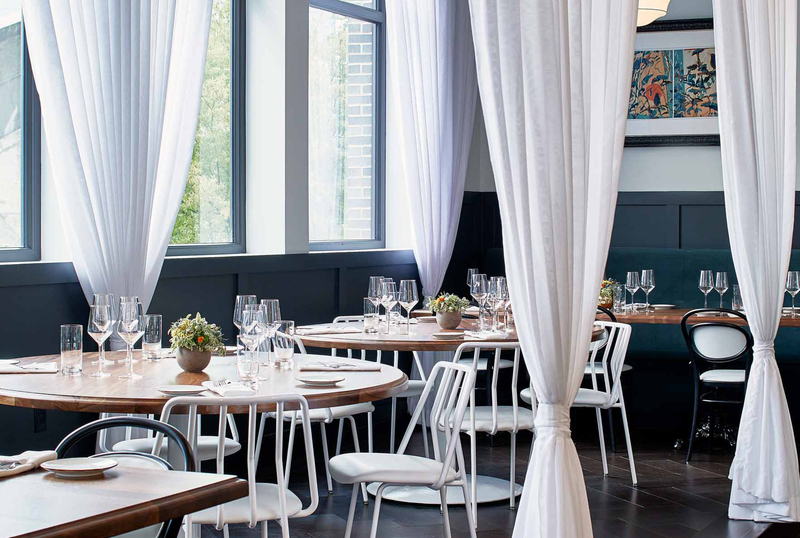 White Leo chairs and classic Bentwood chairs are used in the Whitebird dining room. Designed by The Getty's Group. Image via The Edwin. There’s also a sea of of precisely lined pendants—a new twist on dramatic lighting. 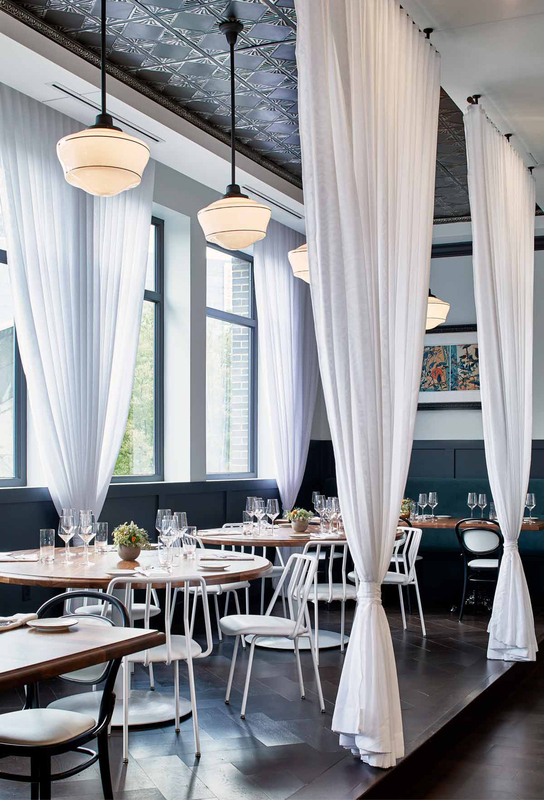 Speaking of drama, did you notice the floor-to-ceiling drapery that separates the dining areas? There should be a rule that all full-service restaurants have floor to ceiling drapery. It’s lovely. Although the restaurant lacks bold color, similar to this Charleston stunner, it doesn’t feel sparse nor dull. With each glance, you discover a bit more: emerald green tiles displayed in an herringbone pattern, the bullnose edge of the dining tables, edible flowers garnishing your root vegetable salad. And I think that’s the point of Whitebird. The details are envelopping, creating an atmosphere steeped in quality and taste. 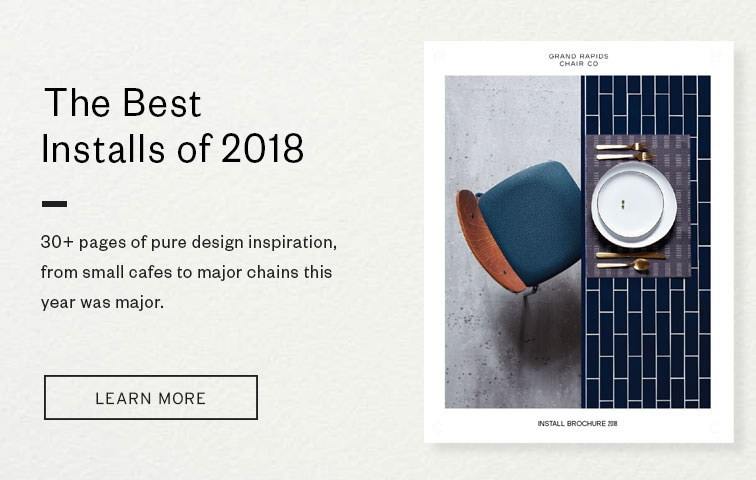 It’s classic design done right for the modern restaurant.